Which Suspend mode do you use? sorry. what ist Suspend Mode? I try MR201 on the comming weekend. I got the info that the MR201 is also working. Does someone tested with MR200 or could confirm the behaviour if the POWER switch with the MR400? The device is in stand by mode, as with you. Why is that relevant? The device turns on with the command “off”. so it seems that the 400 doesn‘t send the byebye message. I‘ll add a change that disables this feature for tge 400/200, so you will be back to the old behavior while tge 401/201 use the thing state. It is noticeable that the ITEM “Online” is missing. The MR400 runs parallel to the MR200. Also “POWER” only reacts to “OFF”. Again, you can turn on with “OFF”. The binding listens to the UPnP SSDP byebye message, which at least is send by the MR401. Don’t pay attention to the Online switch - it’s no longer used and you should get rid of it when removing and re-adding the thing. I mean the thing status under PaperUI->Configuration->Things. Open the thing and it should say ONLINE or OFFLINE. Some revised logging and exception handling, re-factoring etc. the MR400/200 does not send the PowerOff message - so this can’t be detected. works fine with MR401/201 once the channel was changed and the binding got a playEvent. 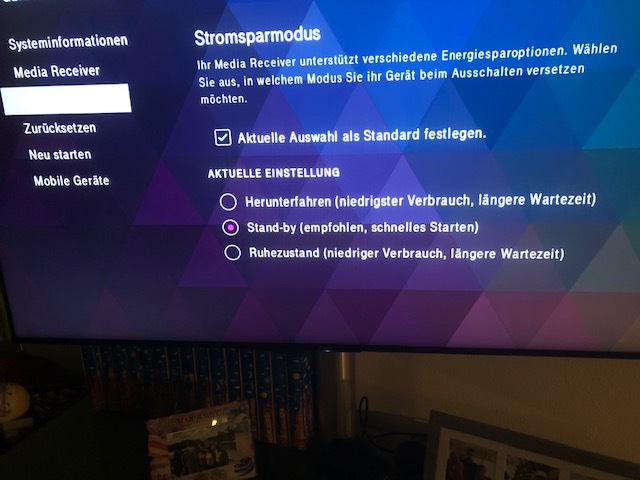 Today i got my brand new MR 401B, updated mi Pi to the latest snapshot and then installed the latest version of the Telekom TV binding. The Thing was discovered via PaperUI, but still stands on “initializing”. 2018-11-21 20:00:29.263 [temChannelLinkRemovedEvent] - Link '21_MediaReceiver401_Channel => telekomtv:receiver:c7123df5-8d21-548e-834e-AC6FBB525687:channel' has been removed. 2018-11-21 20:01:41.844 [INFO ] [g.discovery.internal.PersistentInbox] - Added new thing 'telekomtv:receiver:c7123df5-8d21-548e-834e-AC6FBB525687' to inbox. 2018-11-21 20:01:41.844 [home.event.InboxAddedEvent] - Discovery Result with UID 'telekomtv:receiver:c7123df5-8d21-548e-834e-AC6FBB525687' has been added. 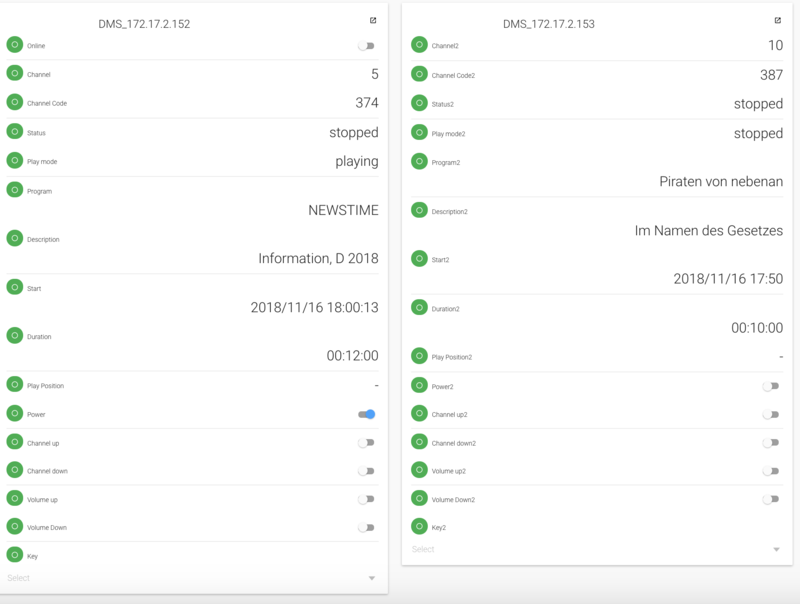 2018-11-21 20:01:58.918 [me.event.InboxRemovedEvent] - Discovery Result with UID 'telekomtv:receiver:c7123df5-8d21-548e-834e-AC6FBB525687' has been removed. 2018-11-21 20:02:36.305 [me.event.ThingUpdatedEvent] - Thing 'telekomtv:receiver:c7123df5-8d21-548e-834e-AC6FBB525687' has been updated. 2018-11-21 20:02:37.454 [me.event.ThingUpdatedEvent] - Thing 'telekomtv:receiver:c7123df5-8d21-548e-834e-AC6FBB525687' has been updated. 2018-11-21 20:02:37.604 [me.event.ThingUpdatedEvent] - Thing 'telekomtv:receiver:c7123df5-8d21-548e-834e-AC6FBB525687' has been updated. 2018-11-21 20:02:37.607 [ERROR] [mtv.internal.TelekomTVHandlerFactory] - TelekomTV.Factory: Device added (UDN=C7123DF5-8D21-548E-834E-AC6FBB525687 ,deviceId=A085F9D762B0A586BB2CAE75A324BE8C, macAddress=AC6FBB525687), now 1 devices. 2018-11-21 20:02:38.357 [me.event.ThingUpdatedEvent] - Thing 'telekomtv:receiver:c7123df5-8d21-548e-834e-AC6FBB525687' has been updated. 2018-11-21 20:02:38.466 [ERROR] [mtv.internal.TelekomTVHandlerFactory] - TelekomTV.Factory: Device added (UDN=C7123DF5-8D21-548E-834E-AC6FBB525687 ,deviceId=A085F9D762B0A586BB2CAE75A324BE8C, macAddress=AC6FBB525687), now 1 devices. 2018-11-21 20:02:38.466 [me.event.ThingUpdatedEvent] - Thing 'telekomtv:receiver:c7123df5-8d21-548e-834e-AC6FBB525687' has been updated. 2018-11-21 20:02:38.546 [me.event.ThingUpdatedEvent] - Thing 'telekomtv:receiver:c7123df5-8d21-548e-834e-AC6FBB525687' has been updated. Today i restarted again with Snapshot #1439 and there where less errors in the log, but the thing stands still on initializing. Hi, there should be more in the log. Wondering why all messages get logged as ERROR? I found the problem with the ERROR logging and updated the binding. Nevertheless there must be more output in your log. Did you entered the credentials in the thing config? Does the properties show a user ID? Check PaperUI->Config->Things->YourThing->SHOW PROPERTIES if those parameters look good.